Born in Nova Scotia in 1862, Dr Robert Buchanan qualified to practise medicine at Edinburgh University in Scotland before crossing the Atlantic where he opened his practice at 267 Eleventh Street, New York in 1886. Despite spending virtually all of his spare time in bars and brothels he managed to maintain a successful practice. On 12 November 1890 he was divorced and 17 days later married Anna Sutherland who had been a successful madam and she became his receptionist. She was short, fat, had dyed orange hair and a large wart on the end of her nose. He persuaded her to leave her not inconsiderable fortune to him in her will. However, when patients learned of the former occupation of the second Mrs Buchanan and saw her vulgarity, they turned away from him leading to a sharp drop in his income. On 21 April 1892 Dr Buchanan announced that he was going to be travelling alone to Scotland but, four days before his departure, he cancelled because his wife had suddenly fallen ill. Buchanan called two other doctors in to treat his wife but she died of a cerebral haemorrhage. Three weeks later Buchanan remarried his first wife, Helen, in Nova Scotia and also inherited $50,000 from his second wife. However, Buchanan’s boasting and his interest in the case of Carlyle Harris, a medical student who poisoned his girlfriend with morphine, led to Ike White, a reporter from the New York World, investigating him. Buchanan had claimed that he could avoid the telltale signs of morphine poisoning (pinprick pupils) by using atropine, an alkaloid derived from belladonna. When Mrs Buchanan’s body was exhumed on 22 May there were no pinpricks in her eyes. The police arrested the doctor. 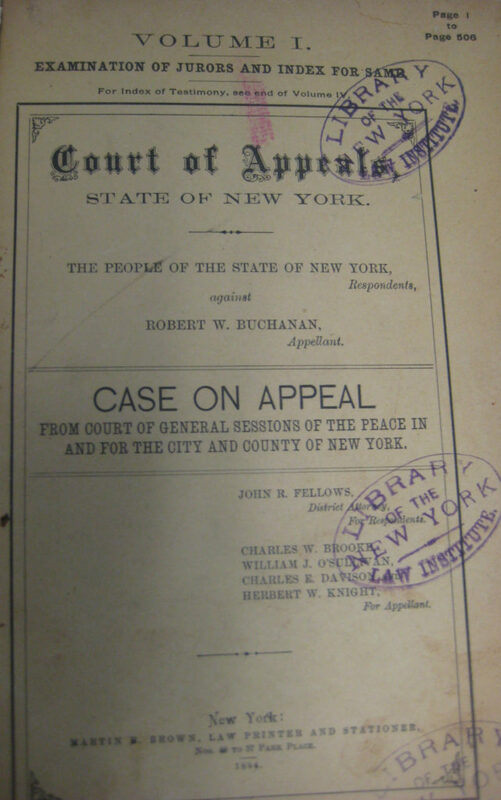 Buchanan’s trial began on 20 March 1893 at New York before Judge E. C. Smyth. It was one of the first trials to be fought almost exclusively on forensic science testimony. During the proceedings, a cat was killed with morphine and then atropine dropped into its eyes. There were no pinpricks in its pupils. Buchanan’s lawyer almost managed to undo a damning testimony from a medical expert but when Buchanan took the stand all hope was lost. The jury retired on 25 April and took more than 28 hours to return a guilty verdict. He died in the electric chair at Sing Sing on 2 July 1895.